Well, I made it. 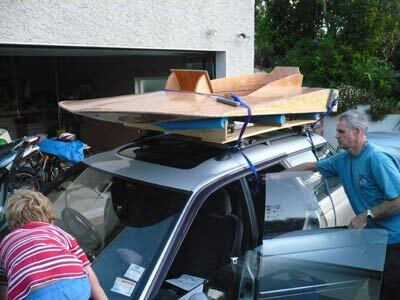 The boat is strapped to the roof of the car. Thanks to everyone who offered to help come round and paint. Your assistance was not required this time. I put the last coat of epoxy on the hull at 6.00am this morning. It was dry by dinnertime and ready to attach to the car. The frame that I built yesterday was a perfect fit and with only two tie downs required it’s ready for the ferry in the morning. We should arrive at Lake Rotoiti around 3pm. The boat remains a work in progress. The finish is not up to my expectations – this is what happens when you don’t plan your activity to the time remaining. But there’s nothing there that a month of careful sanding and another 4 litres of epoxy and varnish and paint can’t fix. I have no doubt that it will be watertight and will remain above the water. This is, after-all, the essence of a boat. Check back early next week for the You Tube link – fingers crossed. Strapped to the roof, that's Garth who helped me lift it on, and Arlo climbing on the bonnet.